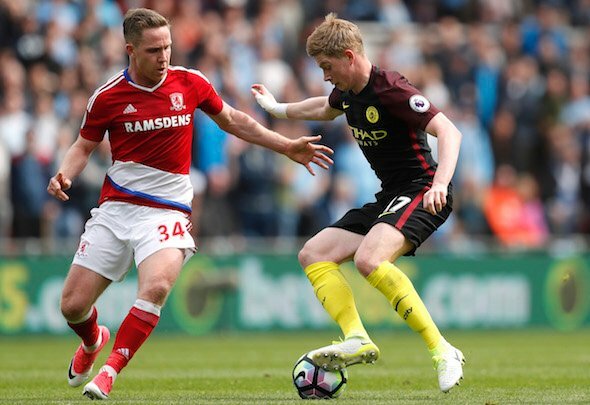 Adam Forshaw is reportedly set to undergo a Leeds United medical on Thursday after they agreed a deal with Middlesbrough on Wednesday night – and fans took to Twitter to deliver hugely positive verdicts. Widespread media reports have stated that United have won the race to sign Forshaw, 26, ahead of Cardiff City after he elected to make the switch to Elland Road. The Mail claim that Leeds have agreed to pay £4million to Championship promotion rivals Boro for the central midfielder after he failed to make an impression on new manager Tony Pulis. Forshaw was a key member of the Boro team promoted to the Premier League in 2016 under Aitor Karanka and he made 34 top-flight appearances last season, but Pulis wants to reshape his team for their own tilt at going up and will use the cash to make new signings. Former Everton trainee Forshaw last played for Boro in a 2-0 win over Ipswich on 9 December. But he has made 103 appearances for the club since a move from Wigan Athletic three years ago and has extensive Championship and Premier League experience. Leeds fans have taken to social media en masse to react to reports that the Forshaw deal is all but done, with one pointing out that it is “like we’re signing actual Jesus” and others hailing him as a brilliant capture as they appear in dreamland at his arrival. Signing Forshaw and De Bock sending BJ back n looking like Klich going at least shows this regime recognises it’s makes and will correct them. #lufc.